As we talked our way through welfare, conservation, legal considerations, political strategies and the influence of external factors on the trade in these animals, it was heartening to find that, without exception, it was agreed that primates should not be kept as pets. With speaker panels and an audience made up of individuals from a variety of professional backgrounds, including the zoo industry, it was refreshing and encouraging to find that those of us who so often find ourselves on "opposite sides of the fence," as it were, were in agreement about our rejection of keeping these complex, highly sentient animals in domestic settings. We identified a number of obstacles that must be overcome if we are to succeed in ending the cruel trade in these animals and we discussed the mechanisms by which any future prohibition might be achieved. It was a hugely beneficial discussion which I hope will lead to positive action for primates going forward. But, as with most things, the devil is in the detail. While we all agreed that primates should not be kept as pets, a few dissenting voices argued that some private, or specialist, keepers kept primates in conditions which were equivalent to those of a "good zoo." Notwithstanding my opposition to zoos and my firm belief that no captive situation can provide fully for the needs of primates (or any other wild animal, for that matter), I was concerned to see these arguments introducing grey areas into what had started as a black and white issue. Specifically, a vast grey area emerged when trying to define the line between a "specialist private keeper" and a "pet owner." This is made all the more complicated by the fact that, while often talked about by those that support the continuance of the trade in primates as pets, evidence of the existence of these private keepers who keep their animals in such fine conditions as to be beyond reproach has not yet come to light. "There is ample evidence to prove that primates do not thrive when kept in private hands but, despite all the talk to the contrary, simply no evidence to suggest that they do." There was talk of the "motivation" of keepers. Some delegates suggested that those keeping monkeys for their own amusement should not be allowed to keep them but those keeping monkeys for educational or conservation purposes might be granted an exception. For me, this overcomplicates a very simple matter. If an animal is unsuited to captivity, then the motivation of the person that keeps that animal is of no importance. After all, the experience of the monkey held captive in unnatural surroundings, unnatural social groupings and far, far from his or her natural environment does not change based upon the motivation of his or her captor. There was the suggestion that breeders supplying zoos with monkeys should be allowed to continue so that the work of zoos was not impacted. [This, in itself, raises concerns about the ongoing link between private breeders and the zoo industry which is perhaps not for discussion here, but worth flagging]. What was clear to me was that all of the arguments put forward for keeping monkeys in private hands were based not upon what was deemed best for the animals themselves, but what was deemed "fair" towards those that want to keep them. This, to me, is to take the discussion in entirely the wrong direction. In my view, the needs of the animals must come before the desires of the individuals that want to keep them. Perhaps some monkeys are kept in the same conditions as they are kept in zoos. But this is to use zoos as the benchmark for providing animals with environments well suited to meet their needs. I think to use this as the basis for any decision making is to do primates a significant disservice. On the other hand, if we use the animals' needs and natural behavior as a starting point it seems logical that we can conclude that primates (none of whom are native to the U.K.) are simply unsuited to captivity, regardless of whether their cage happens to be in a zoo or in someone's back yard. I accept that, for now, we are not in a position (either practically or legally) to remove primates from zoos. But if we have an opportunity to remove them from other captive situations, I firmly believe that we should do so. This is not about being fair to people who want to keep monkeys as pets, whether they consider themselves "specialists" or otherwise. This is not about avoiding upsetting those people who have invested time, money and energy into creating enclosures for their pet monkeys. This is not about trying to avoid hurting people's feelings. In fact, this is not about people. It is about doing what is best for the primates. We all agreed, to some extent or another, that it is difficult (some of us argued it was, in fact, impossible) to meet the needs of primates in captivity. If this is the case, then surely we should use this knowledge as our starting point. It may be that some pet primates suffer less than others. It may be that some pet primates do not suffer at all (though any evidence to prove this is notably lacking). But regardless of hypothetical exceptions to the rule, we know that primates have suffered, and continue to suffer in private hands. I have spent years working with ex-pet primates that pace, rock, self harm and head twist. I have seen rescued primates meet others of their own kind for the first time since they were taken from their parents and struggle horribly to come to terms with their new lives; this manifests itself in anxiety, aggression, social withdrawal and fear amongst other things. I have seen babies who should be with their mums cling desperately to their human surrogate as they are forced to experience the world far from their natural home and their troop. 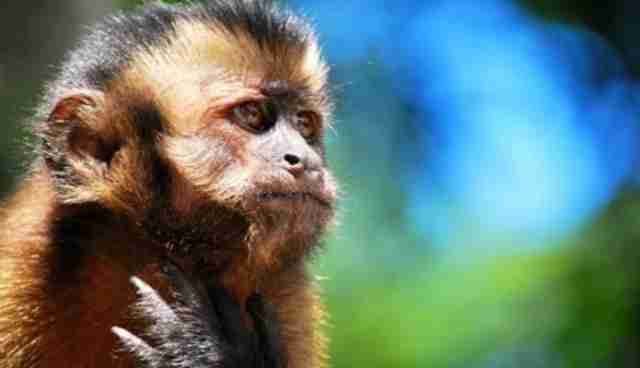 I have seen ex-pet monkeys suffer debilitating health problems and I have seen ex-pet monkeys die from those problems. Yet all of this can be stopped for good. We have a way to ensure that no primate has to suffer in this country again; and that is by introducing a ban on private ownership. Yes, some people might be upset but when it comes down to it, but should avoiding upsetting people really be the focus of our concern? I think not. In the campaign to see an end to the primate pet trade there are still lots of details to be ironed out and lots discussion still to be had. However, after Friday, I am confident that, by using the expertise of the group of people in attendance last week, along with all those others who share the same convictions, we can and will end this trade. But if we are to succeed we absolutely must put the primates first. Thank you to Born Free Foundation and Humane Society International for organizing and hosting the conference.